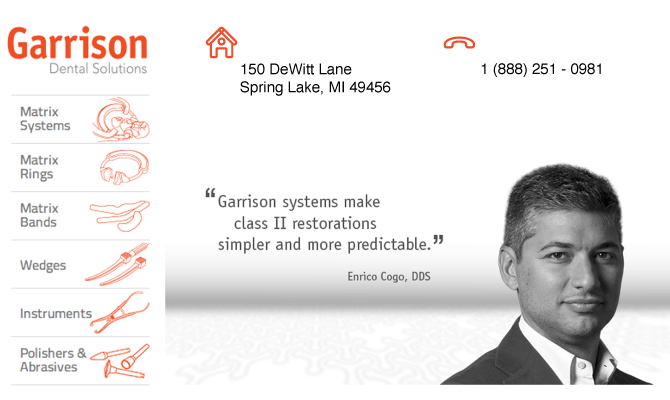 Like so many entrepreneurial businesses in America, Garrison Dental Solutions started out in a basement; the basement of Dr. Edgar and Dr. John Garrison’s dental practice. That’s where the original Composi-Tight Sectional Matrix system was brought to life back in 1996. Many years and several hundred million matrix bands later, that same energy and enthusiasm that got the ball rolling is still driving us forward. It was a family business back in the “good ole days” and still is today. Three of our four founding partners are still with us. Brothers, Tom and Dr. John Garrison along with good friend and engineer Rob Anderson are keeping steady hands on the wheel. Tom and John’s father, Dr. Edgar Garrison, the fourth partner passed away in 2009. The company is still headquartered in Spring Lake, Michigan. Although we have moved out of the basement, we didn’t go far. Just to the other side of the parking lot and into a new building we built in 2006. We’ve expanded in other areas as well. Our flagship product line, the Composi-Tight Sectional Matrix System has grown to the number one product of its kind and is used on all seven continents around the world. Yes, even the dental facility at McMurdo Station, Antarctica has Composi-Tight. We’ve achieved that reach through continuous improvement. Garrison continues to improve our products and searches for new opportunities every day. Who knows where else you’ll find our products in the future!